The Outlaws played at Vistabella Conquistadores and got a fine 10-2 aggregate of 97-69, winners were L Burns T Dix E Bennett 24-14, V Cameron P Willicott R Clive 20-10, J Close T Harris A Burns 21-13, L Freeman T Capewell D Close 16-12. 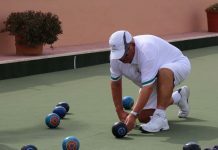 On Monday the Palominos entertained Country Bowls Flamingos and took just one rink, though one other was just a one shot loss, not a bad result against a stronger team and it’s important to remember it’s only a game. The Pintos were at Monte Mar playing their Toreadors and had a good morning, always a favourite venue for me, coming away with one win and two draws, losing the overall shots by a small margin. In the afternoon the Raiders play host to Emerald Isle Saturns and put in a great performance, taking 4 rinks and drawing the fifth. Thursday found the Raiders playing their 17th December fixture at home to the Vistabella Buggies, a very strong opposition. With the Raiders conceding one rink they did very well to win 2 rinks and losing another by just the one point, in a match played in very good spirits. On Friday the broncos played host to Montemar Matadors and won 2 rinks, not a bad effort against a tough opponent. In the afternoon the Rangers entertained Greenlands Elms and played well to share the points, 2 rinks and the overall shots with another lost by just the one shot. In the Discovery Division, The Maples were away to Emerald Isle Moonrakers. Final score was shots – 100 – 68. Points – 10 – 2. Best winning rink – Carol Rudge, Mike Keating, Dave Webb. 24 – 13. In the Discovery Division the Sycamores were at home to Emerald Isle Neptunes. Final score – shots 81 – 81. Points 7 – 5. Best winning rink, Lyn Morris, Zoe Wilcock, Tom Hill. 19 – 12. In the Winter League, we were at home to Benitachel. Final score – shots – 69 – 97. Points – 4 – 8. Best winning rink – Jean Giddings, Doreen Watt, Roy Cordell, Diane Ridley. 18 -14. In the Southern League Division A, the Oaks were at home to Quesada Swallows. Final score. Shots 76 – 78. Points 6 – 6. Best winning rink – Linda Hier, Mike Keating, Dave Webb. 18 – 13. In the Southern League C Div. The Elms were away to El Rancho, final score – 86 – 91. points 4 – 8. Best winning rink – S Sellwood, J Thompson, J Dowell. 17 – 14. In the Southern League Div C. the Cedars were home to Vistabella Swingers. Final score – 106 – 74. 10 – 2. Best winning rink – Anne Butterworth, Zoe Wilcock, Tony Hodges. 22 – 11. The total shots were 90 for to 85 against giving the Royals 5 points to 7 for San Luis. On Wednesday 5 Dec, our club held its annual Christmas Dinner in the Olympia Restaurant in Mil Palmeras. A great night was had by all, dancing the night away to the great and fabulous entertainment of the Blend Male Harmony Duo and guest star June Gibson. We would also like to thank the Queen Victoria Bar, Cabo Roig, The Rusty Nail, Campoverde, Debbie hair and nails, Campoverde and the Asia Restaurant Pilar for their kind donation to our raffle. Performance of the week came from Willie Mcvey in the Sputniks home fixture in the Voyager Division against San Luis Vulcans. With his rink losing on the final end by 3 shots his final bowl removed the Vulcans saving bowl and gained 5 shots to win his rink with Dot & Joe Kocsis by 2 shots and therby enabling the Sputniks to win the overall match by one shot, 82 shots to 81.The other winning rink came from Gary Randall with Sheila Millward and Jim Eastwood, so 8 points to the Sputniks and 4 to the Vulcans. The Pioneers in the same Division played 3 matches and their best result was a 9-3 win away at San Luis Romulans.Two big winning rinks came from Doug and Fay Beattie with Norman Adcroft and Barbara Cooper with Tony Campell and Dave Laverick.The other 2 matches finished with 10-2 losses against Vistabella Buggies away and San Miguel Pointers at home. 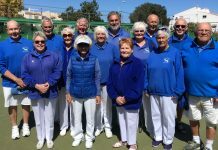 Our Winter League team entertained a strong opponent in Javea Green and managed just the 2 points gained from the rink of Irene Laverick, Tony Dalton, Pat Harman and skip Jenny Bowman winning 23 shots to 17. In the Southern League A Division the Blues travelled to E.I Claymores and came away with a 7 points to 5 victory winning the overall match by 86 shots to 80.Dave Davies, Harold Charleton and Irene Mangan winning 26-12 whilst John Ball, Brian Gardiner and Alex Morrice won 19-13. 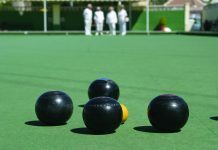 The Golds in Division B entertained Country Bowls Geckos and managed to win by 102 shots to 90 picking up 9 points to the Geckos 3.Best winners for the Golds came from Doug and Fay Beattie with Norman Adcroft winning 28-16 whilst Tony Campbell, Val Dalton and Rab Logan won 17-10. The Silvers in the C Division were visited by Emerald Isle Roundheads and the match finished with both teams picking up 6 points.Dot Kocsis with Rod Edgerton and Alan Ralph won 23 shots to 11 whilst Hilary Clarke with Molly Russell with Willie Mcvey won 10-13 which gave the Silvers to win the overall match by 2 shots, overall score 86 shots to 84. This was the Toreadors third match in four Days, so the win against the Sycamores was even more rewarding. The Toreadors won on three rinks drew on one and lost on one. Well done everyone. The team carried on their winning streak form Thursday game by winning on four rinks and taking the overall shots. A big well done to everybody, it will be a good boost to our position in the league. The Matadors played away at Quesada and there was some very good bowling. The Matadors won on two rinks and drew on one rink. Well done to the winning rinks Pauline Merry, June Young skip Chris Merry and Lynne Armitage, Ronnie Cairns skip Dave Melville. The Toreadors responded well to the visit of top of the league Pintos, winning on two rinks drawing on two rinks and losing on one rink. Well done to everyone for a good all round performance. The second visit to Quesada was not a good result for the Matadors as they lost on all the rinks, bad day at the office. Away to San Luis Monte Mar had a great result, winning on three rinks but losing on shots. 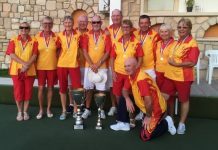 A big well done to the winning rinks of Lynne Armitage, Chris Harding, John Hunt skip Joan Harding, Gina Hindle, Diane Horsington, Danny King skip Jack Burrell, Jan Soars, June Young, Mick Soars skip Dave Melville. 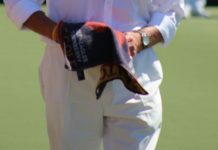 The Winter weather has been very kind to us, with some very pleasant bowling in sunny and warm conditions this week. On Monday Quesada Diamonds had a good mornings bowling with La Marina Explorers. Some close games on the rinks where Quesada managed to win both by two shots and ended the match winning on four rinks and losing on one rink. The shots were 91 to 90 in La Marina Explorers favour. Result was 8 points to Quesada Diamonds and 4 points to La Marina Explorers. Also on Monday Quesada Pearls had a very successful match against MonteMar Matadors, winning on all of the rinks as well as the overall shots. The result was Quesada Pearls 12-0 points and 140 to 46 shots. This means they are in third place in the league chasing Emerald Isle titans and San Luis Klingons. Meantime, in the Explorer Division, Quesada Rubies came up against La Marina Pathfinders who were on good form and won the match 9 points to 3 and 94 shots to 86. In the Winter league on Wednesday, Quesada suffered a defeat with El CID winning 10 points to 2 with shots 91-75. On Friday, there was mixed fortunes for the teams. The Swifts travelled to La Manga and put up a brave fight against a strong La Manga Crusaders team. 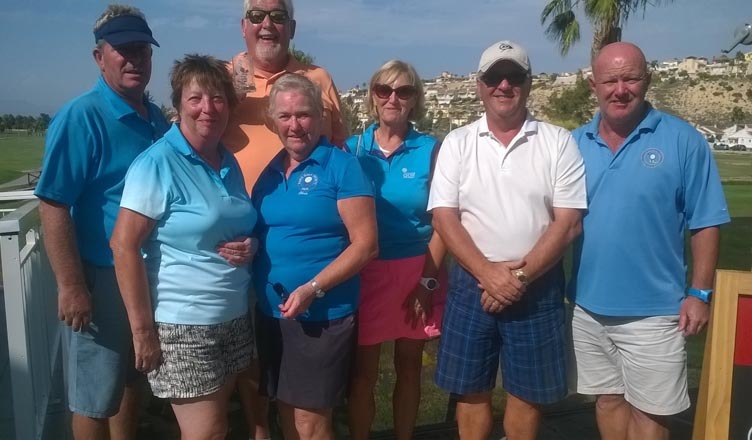 The match ended with a win for La Manga 10-2 points and 112-64 points. And Quesada Swallows played Mazarron Miners who won the match 8 points to 4 and 100 points to 88. 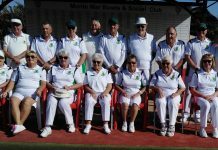 For more information about our club, please contact our membership secretary Angie Goddard newleaf2014@hotmail.co.uk New bowlers are always welcome and introductory coaching is available. Some mixed results but another lovely sunny week for bowling; hard to believe that it’s December. SA League Monday 3rd Klingons away v EI Titans; a good result, 100-78, points 8-4. Winners: Bob White, Sheila Cammack, Giuseppe Galelli 30-10, William Holtham, Sabrina & Russell Marks 19-17, Ray Clarke, Peter McEneany, Keith Jones, 26-12. Trekkers home v LS Apollos had a good result 99 shots -92, 8pts-4. Winners: Shirley Verity, Jo & Jules Pering 22-10, Kevin McKenna, Marina Beardsall, Barry Edwards 25-19, Judy Carroll, Graham Bird, Derrick Cooper 20-15. Vulcans away v LS Sputniks, a close result 82 shots-83, 4pts-8. Winners: Chris Jackson, Kath Waywell, Phil Hasler 21-15, Audrey Ford, Margaret Clarke, Drew Russell 18-14. Romulans: home v LS Pioneers; shots 65-96, 3pts-9. Winners: Pat Barnes, Tom Fromson, Harry Epsom 18-14, Mary Fromson, Danny McErlean, Lyndon Johnson 17-17. Re-arranged match from 17th Dec, played 5th Dec away v EI Saturns; 4-8, shots 62-79. Winners: Roger Inwards, Mary Fromson, Lyndon Johnson 28-10, Chris Phillips, Terry Baylis, Geoff Francis 17-13. 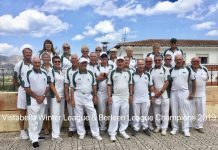 Wednesday 5th Winter League: SL home v Monte Mar, a close result: 6 pts-6, shots 96-71. Winners: Shirley Verity, Ray Clarke, Sabrina & Russ Marks 31-9, Jan Pocock, Keith Phillips, Dave Blackie, Scott Malden 24-11. Thursday 6th: PREMIER 20 K/O COMPETITION 2nd round, v Javea Green; San Luis WINNERS. HOME: singles: Colin Jackson 21-20, pairs: Jan & Brian Pocock 18-18, rinks: Kath Reid, Pam Lockett, Dave Blackie, Scott Malden 19-16. Points: 5-3, Shots: 73-72. AWAY: Singles: Ian Kenyon 21-11, Pairs: June & Keith Jones 24-15, Trips: Shirley Verity, Jo & Julian Pering 18-15. Points: 6-2, Shots: 82-63. Semi final v El Cid to be arranged for January. Southern League: Friday 7th Lions, away v EI Cavaliers, a hard fought result; 5pts-7, shots 82-92. Winners: Kath Reid, Pam Lockett, Ian Kenyon 26-6, Colin Jackson, June & Keith Jones 19-19, Ann Holland, Sheila Cammack, Ray Pollock 14-13. Tigers, home v LM Ospreys, 4pts-8, shots 76-82. Winners: Shirley Verity, Jo & Jules Pering 23-11,Ros Holmes, Jan & Brian Pocock 20-14. Leopards home v HO Royals; 7pts-5, 85 shots-90. Winners: Marie Henley, Cas Blay, Bob Bromley 19-15, Audrey Ford, Ray Watmough, Phil Hasler 23-19, Derek Barker, Ian Ross, Geoff Shand 20-14, Chris Jackson, Sue Ross, Drew Russell 16-16. The Pointers played 2 matches this week with mixed results. The first on Monday against Vistabella’s Buggies resulted in a loss, 4 points to 8, 88 shots to 98. Of the 2 winning teams, the best result came from Paul Cutting, Lee Sinclair & Alan Campbell who won 24:16. Their 2nd match, rearranged from 17th December, was a much better affair. 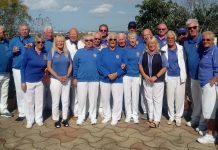 Away to La Siesta’s Pioneers, they managed a creditable 10 points, 81:73, lifting them to 2nd in the table, with Joyce Reeeves, Bill Reeves & Lee Sinclair leading the way – 19:14. Continuing with the good news, the Beagles at home gained 10 points against Vistabella’s Drivers, 123 shots to 77, with Margaret Patterson, Johnny Raby and Stuart Denholm recording a superb score of 38:16. The Dalmatians did even better with a 12:nil victory over Vistabella’s Eagles, 100 shots to 71. Bob Nesbitt, Dave Champion & Barbara Scotthern once again topped the team winning 24:14. 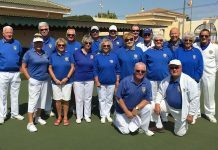 Finally, the Alsatians faced the last of the Vistabella teams, the Albatrosses, and managed to gain just 2 points thanks to a narrow win by Anita Brown, Ron Nairey & Eddie Cowan, the overall shots being 60:95. The Winter League team had a bye this week but Friday saw the Boxers and the Bulldogs in action. The Boxers, away at Monte Mar faced the Toreadors and had big wins on 2 rinks, with 2 further rinks just missing out. The best winning rink belonged to our new members, Marilyn & Gerald Shatwell, skipped by Ann Allen, 24:6, helping the team to 6 points, 86 shots to 63. The Bulldogs faced yet another Vistabella team, the Lanzadores, and unfortunately got hit. The team managed 2 points, courtesy of Paul Hayward, Eddie Cowan & Dave Greenland who won 12:10, with the overall shots a horrible 67 to 100. They will hope for better things next week. 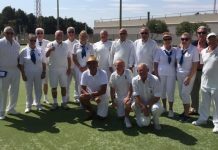 Vistabella Bowls Report – With Lynne Bishop. Twelve matches this week…no time to put our feet up! 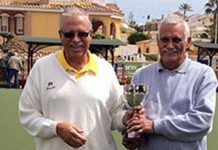 SAL Enterprise league Albatrosses were at home to San Miguel Alsatians, they picked up four wins and the fifth lost by one shot. VB 95(10) – 60(2) SM. The Drivers re-arranged away match to La Siesta Apollo’s resulted in one win. VB 78(2) – 84(10) LS. On Monday they played the Beagles at San Miguel where they also only had one win. VB 77(2) – 123(10) SM. Discovery league. The Eagles at home to the SM Dalmatians unfortunately lost on all rinks. VB 71(0) – 100(12) SM. Voyager League. The Buggies played three games..two being re-arranged. The first one was at home to La Siesta Pioneers, a good result with four wins… VB 85(10) – 63(2) LS. 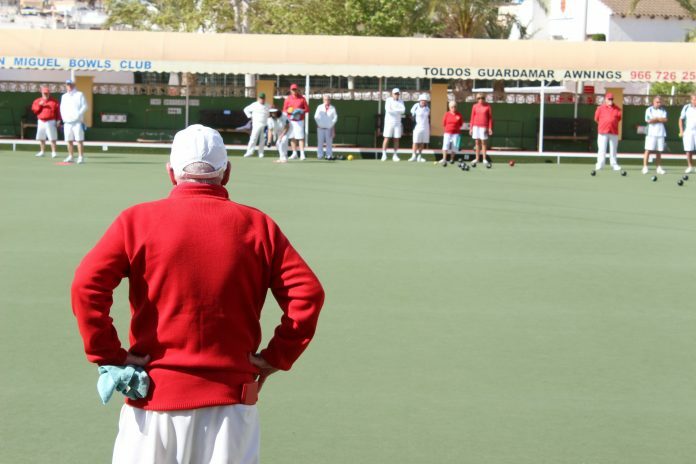 On Monday they were away to San Miguel Pointers, they won on three rinks and the long game. VB 98(8) – 88(4) SM. The second re-arranged game was at El Rancho…the second visit there in a week for some…Lucky you! The team had two wins plus points & shots for El Rancho failing to field a full side. VB 71(8) – 57(4) El. WINTER LEAGUE on Wednesday at home to Bonalba. A beautiful mornings bowling with a result to match, Four wins and a drawn game. VB 130(11) – 59(1) B. The Berleen team also had a good win of 18-10. SOUTHERN LEAGUE Div A. The Lanzadores smashed it at San Miguel, taking four wins from the Bulldogs. VB 100(10) – 67(2) SM. The Picadors at home to El Rancho Mustangs had a disappointing result with only one win. VB 66(2) – 83(10) ER. Div C Conquistadores home to the Emerald Isle Outlaws also had just one win. VB 69(2) – 97(10) EI. Finally the Swingers finished the week off by winning one game at Greenlands against the Cedars. VB 74(2) – 106(10) G.
One more game to go before Christmas ..make the best of it and finish on a high. Next articleWHO LOVES YA BABY!